The tepid recovery has mired millions of Americans in poverty as the fallout from the Great Recession continues to cast a pall over the economy. The number of Americans living at or below the poverty line remained stubbornly at 15 percent in 2012, the second straight year that the rate was flat, despite an economy that's been slowly improving, government data showed Tuesday. The Census Bureau reported that 46.5 million Americans were living in poverty last year. The 2012 poverty rate was 2.5 percentage points higher than in 2007, the year before the financial crisis that sent the American economy into a tailspin. 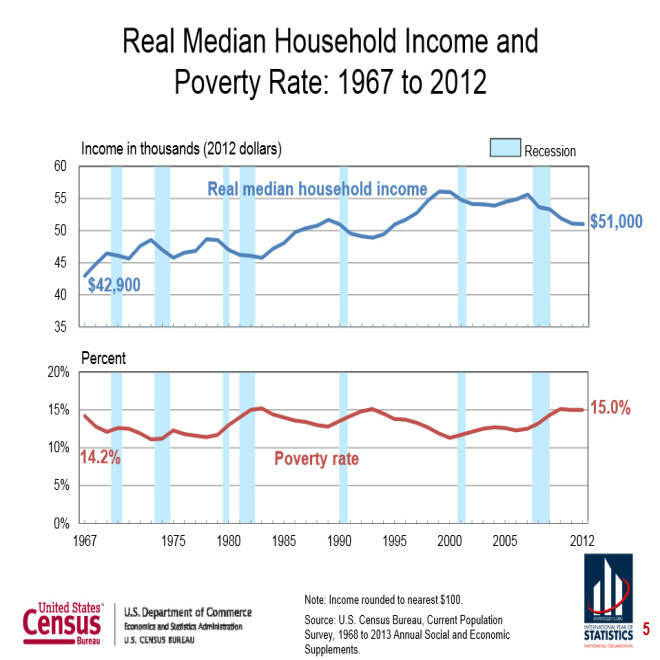 Median household income also essentially was unchanged, at $51,017. Compared with pre-recession levels, however, it was still 8.3 percent lower than 2007, and 9.0 percent below the income peak in 1999. The data showed an economy that's just muddling along: It's not deteriorating badly, but it's not improving at a fast enough clip to help alleviate poverty for millions of Americans. One mildly bright spot: The number of Americans living without health insurance slipped slightly to 15.4 percent in 2012, from 15.7 percent in 2011. Numerically, there was not much of a change, though -- 48.0 million versus 48.6 million. The nation continues to see a sharp racial divide in the incidence of poverty. In 2012, the Census Bureau reported that the poverty rate was 27.2 percent among blacks and 25.6 percent among Hispanics. 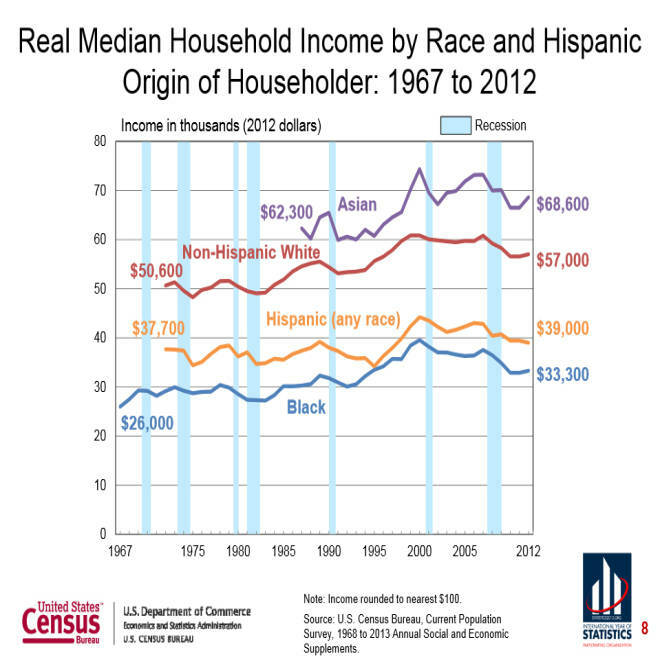 For non-Hispanic whites, the 2012 poverty rate was 9.7 percent. For Asians, it was 11.7 percent. The pay gap between men and women didn't budge either. The median income for women who worked full time, year round was $37,791, about 77 percent of the $49,398 that men earned. By age, about 22 percent of America's children under 18 were living in poverty in 2012, compared with 13.7 percent of people aged 18-64 and 9.1 percent 65 and older. Those numbers were not much different from 2011, except that the number of people 65 and older rose. The poverty threshold for a family of four that includes two children under 18 was $23,283 in 2012, according to the report. "We are not where we want to be yet. Too many Americans cannot find work. Growth is not fast enough. And the very definition of what it means to be middle class is being undercut by trends in our economy that must be addressed," Treasury Secretary Jack Lew said in remarks before the Economic Club of Washington, D.C., on Tuesday. "These trends—like the increase in income inequality and the decline in upward mobility—did not happen overnight. And it is going to require work and focus to reverse them," he said.